Recently announced a new record efficiency, in this case the call module efficiency. Usually is separated into cell efficiency, this being achieved only by the cell efficiency, and module efficiency, that which is achieved with the module in normal working conditions. The Australian company RayGen Resources and the University of New South Wales have built a solar system with a world record efficiency of 40.4 percent. The results were verified in test facilities NREL and easily surpassed the previous record of 36.7 percent module, which was established in collaboration between the Fraunhofer Institute and the developer Soitec CPV solar cell using a 4J. In a statement, John Lasich, CTO of RayGen, said the company is able to achieve a system efficiency of 45 percent in the coming years. The technology used by RayGen CSPV consists of a photovoltaic receiver ultra-efficient concentration combined with optimized collector heliostats (mirrors a set of solar tracking) (CPV). In this system, the heliostats concentrate sunlight on the photovoltaic cells in the central receiver, located at the top of a mast with the heliostat field. By using large sets of mirrors inexpensive technology can improve the problems CSPV cost compared to other solar technologies and therefore significantly reduce the cost of solar energy on a large scale. The (photovoltaic concentration) CPV technology represents 0.25 percent of the global market for photovoltaics in 2014 (40 GW). Proponents of this technology mentioned the benefits of CPV; their low water requirements, low environmental impact and soil, ease of obtaining permits and lower system degradation over the years. But compared to crystalline silicon solar panels with the price in tatters, the degree of risk of CPV in terms of price, reliability and bankability has prevented technology marketing reach and scale of conventional photovoltaics. At this time, there are three companies of CPV in developing viable commercial projects: Soitech, SunPower, and Suncore. In addition to multiple technology developers as RayGen or Solar Systems, investing huge amounts of dollars on the most promising technology in terms of reduced costs of all solar photovoltaic technologies. This new high efficiency system comes only to reinforce the trend of the last decade; PV is becoming cheaper and more efficient time being the production cost less than the electricity network in many countries, including Spain. The report of the European Commission in late 2013 about the cost of generating electricity using photovoltaic proves it. 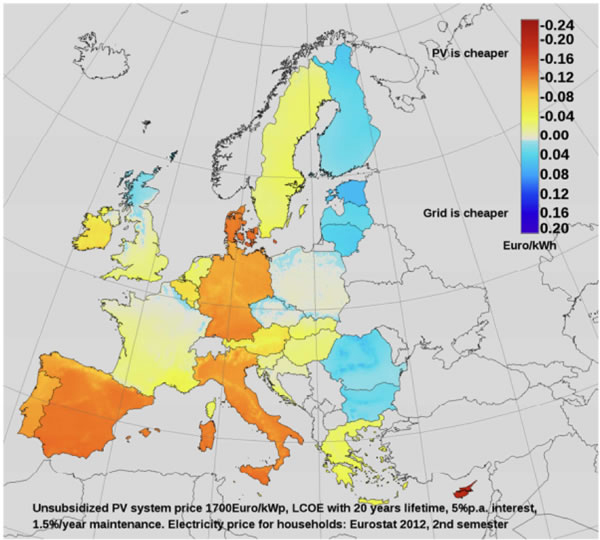 In Spain the cost of generating electricity with photovoltaics varies between 8 and 10 eurocents per kWh generated, with the average price of electricity (in 2012 according to Eurostat) of 23 eurocents. 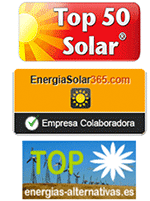 The price cut solar panels, coupled with an improvement of other systems that make installation company has achieved this milestone. 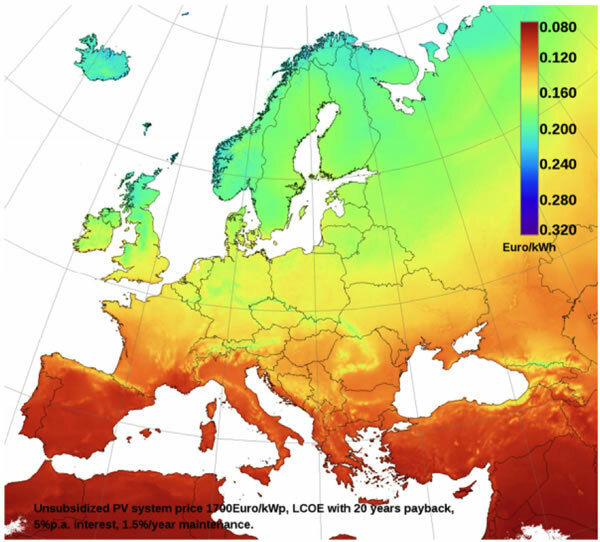 Which leaves a European map of countries where photovoltaic electricity is cheaper than electricity from the grid. This clearly demonstrates that photovoltaics, either by installing solar panels kit small scale or large generating plants on a large scale is a tool for many countries to be more competitive, thanks to lower their energy costs.